Bilbao is known as the financial capital of Basque Country. At first, I just planned to pass through on my way to San Sebastian. But then I saw pictures of the Guggenheim Museum, designed by Frank Gehry, and I knew I should see it. 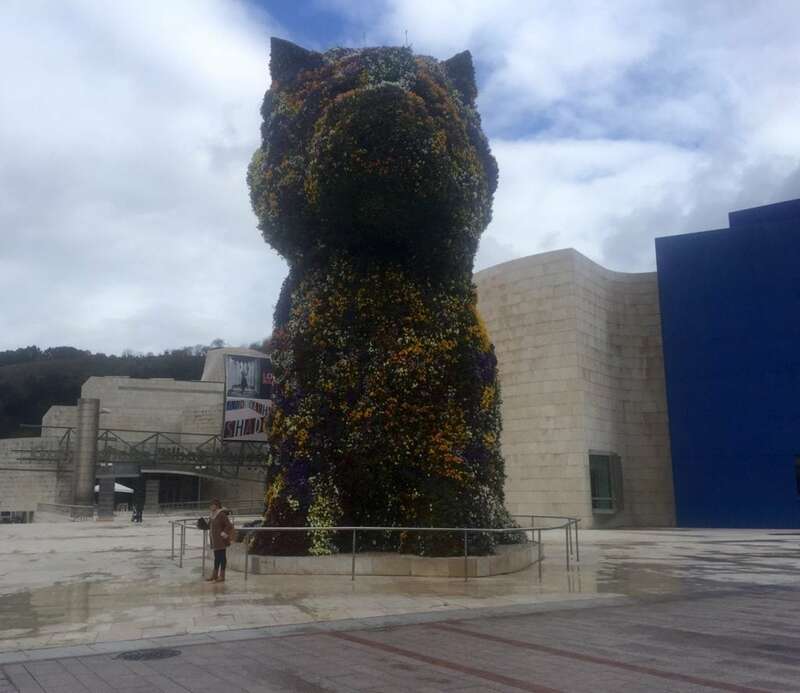 We had a pretty full itinerary, but I felt like we needed to at least spend one day in Bilbao. Unfortunately, we didn’t have the best weather while we were in Bilbao, so we couldn’t just walk around and explore the city. 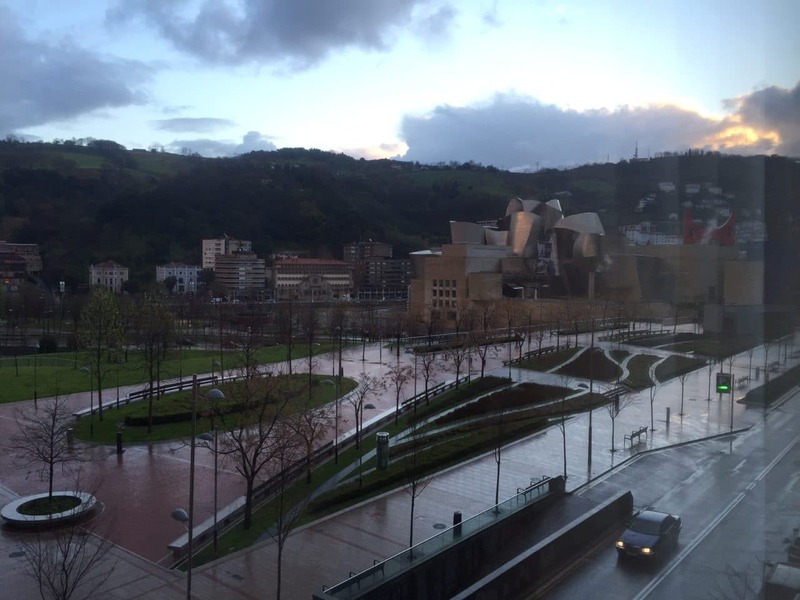 We stayed at Hotel Miro Bilbao, located pretty much across the street from the Guggenheim. From our hotel room window, we could see the museum and the old town area was about a 15-minute walk. We could see the Guggenheim from our room at Hotel Miro. When we arrived at Hotel Miro, Alfonso, one of the friendliest front desk employees I have ever met, greeted us. We learned about the courtesy lounge that the hotel has in the lobby. It was stocked with tea/coffee and some snacks (including my favorite – gummies). It was all self-serve. We would definitely take advantage of this during our stay in Bilbao. We headed up to our room, and like we were warned the room numbers were on the ground rather on the door. Just like the lobby, the room was very modern and stylish with very clean lines. I love the huge window and we had a great view of the Guggenheim. Hotel Miro is located in the best area to stay in Bilbao. 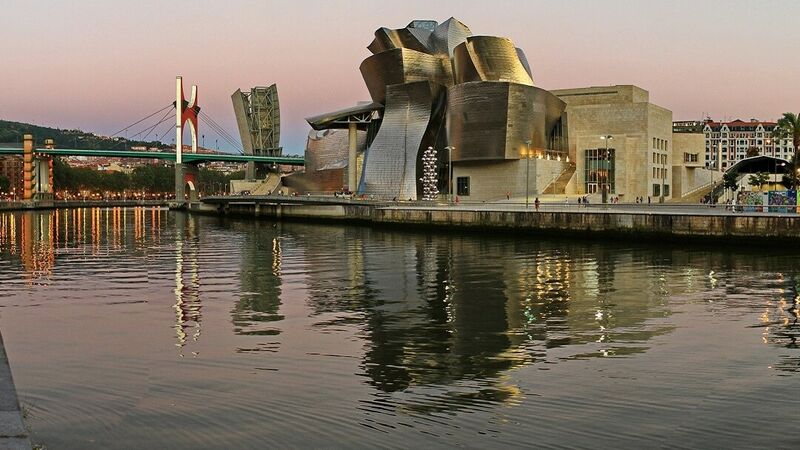 It is basically across the street from the Guggenheim Bilbao and just a short 10-minute walk to Bilbao Old Town. It doesn’t get much more convenient than that. The bathroom was very nice too. The toilet was separate from the shower and vanity, which is always nice especially when you are sharing a room. The vanity section could be open to the rest of the room or closed off with a curtain, so you could watch tv while doing your makeup if you wanted to. The bed was very comfortable, perfect for a siesta. 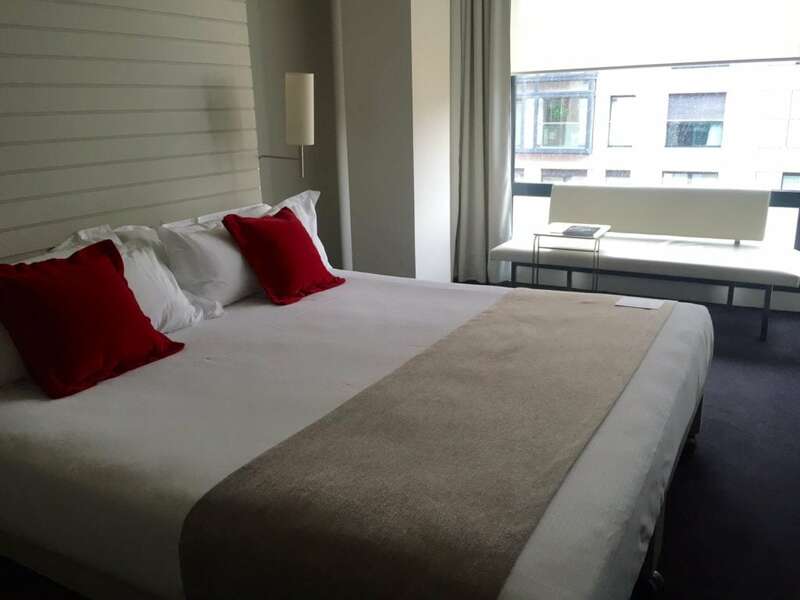 Our comfortable bed and huge window in our room at Hotel Miro. The hotel also has a small restaurant on the first floor. They serve what they call the brown bag breakfast, which includes fancy breads with artisan jams and honey. They also had fresh squeezed orange juice. It was a nice way to start the morning. If you are hungry for more, there is a menu with eggs and other items that you can order. We couldn’t have asked for better accommodation in Bilbao. 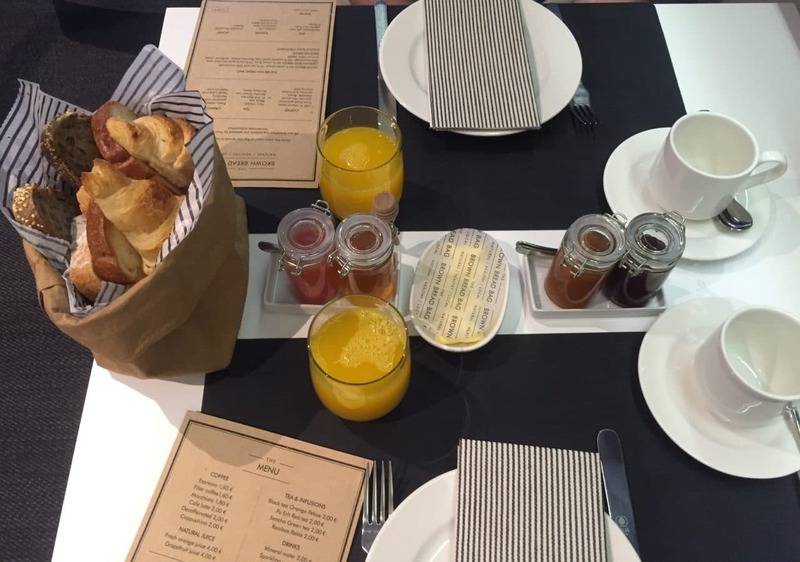 The brown bag breakfast is a great way to start your day. Then we were off to the Guggenheim. We had already admired the architecture from our hotel room, but before we went in we had to check out the dog plant sculpture outside the museum. It is huge and you can’t get a sense of its size until you stand next to it. Then we went inside. They had an interesting umbrella check station. You hang your umbrella and lock it and take the key. After securing our umbrellas, we got our tickets and entered the museum. The Guggenheim museum price varies (check their website) but will be something around 10€ for adults. The puppy flower topiary is huge! It is the perfect building for a modern art museum, it has Frank Gehry’s unique style. The atrium is very impressive. The windows give you a nice view of the river and the sculptures outside. I loved the tulips one, it was so colorful, which was nice on such a gloomy day. Love the colors in the tulip sculpture! Also in the atrium was one of my favorite exhibits in the museum. At first, it just looks like some light display on the wall, but you must go closer. You can actually go through it. On one side the lights are red and the other blue. It’s not just lights, they spell words. It is almost mesmerizing and at times it made you feel like you were moving when you weren’t. The artist is Jenny Holzer. We were also very happy to see an exhibit from Richard Serra. We first became fans of Serra during our visit to DIA in Beacon last year. I love that his art is so interactive. You walk into each piece and you don’t know what is around the corner. There was a very informative video at the end of the exhibit. You can also view the exhibit from the balcony, which gives you a whole different perspective. I enjoyed watching how others were experiencing the exhibit from above. We also enjoyed the Andy Warhol exhibit (which is only there until October 2, 2016). It is a lot different than his works that I have seen at MOMA. “Shadows” is 102 similar but different canvas paintings hung side by side. There are a lot of different bright colors. You enter and your eyes follow the paintings around the large room. YOU MIGHT ALSO LIKE: Met vs MOMA: Which Museum is Best? Another sculpture outside the Guggenheim. As can be expected with contemporary art, some exhibits we just didn’t get or like, but overall the museum is definitely worth a visit. 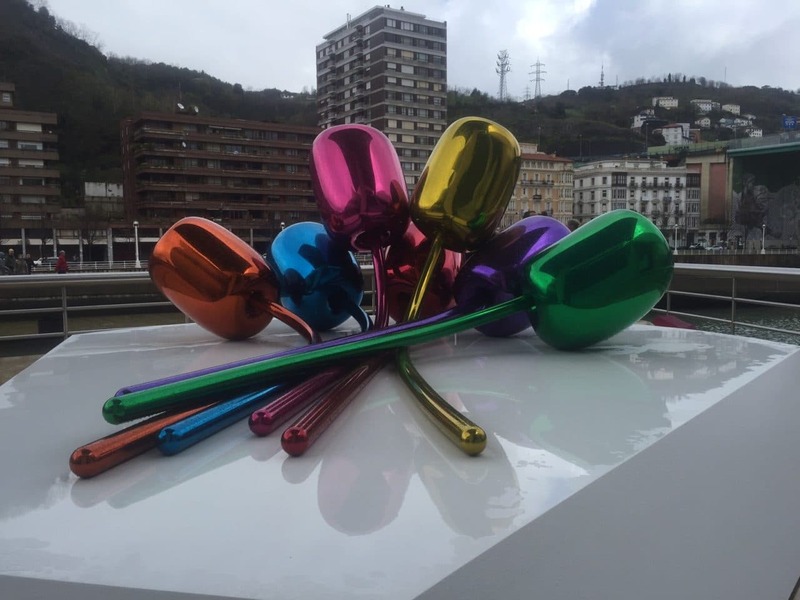 We had about two hours to spend at the museum, which was almost enough time to see all the Guggenheim Bilbao highlights. Then we had time for pintxos before our aqua wellness appointment back at Hotel Miro. We figured the spa would be a great way to end our one day in Bilbao and relax after what had been an amazing vacation in Spain. I wasn’t exactly sure what to expect. We went downstairs and the door was locked, so we went back to the front desk to get the key. Then we entered our own private water relaxation area. There was a steam room, jacuzzi, and fancy shower plus two comfortable lounge chairs. We started in the steam room and then moved to the jacuzzi. Then it was time to hit the shower. It had a rain shower head but also sprayed you from the wall. It was almost like a human car wash. After the shower, we had a little time to relax and enjoy some tea in the lounge chairs. It was a very relaxing experience. 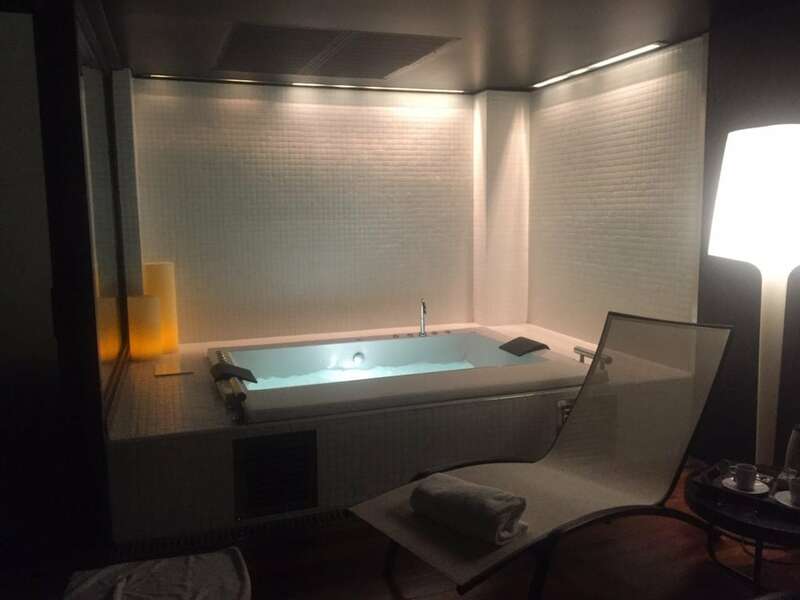 The aqua wellness room was so peaceful and relaxing. I should add that by the time we had to head to the airport, the weather had totally cleared and the sun was out. Talk about bad timing! Well, we still enjoyed our one day in Bilbao and I hope to come back. Have you been to Bilbao? I would love to hear about your experience and favorite places. I would recommend allowing 2-3 hours to see the Guggenheim. Please note that photography is not allowed inside the Guggenheim. If you are looking for a gourmet restaurant, there are two at the Guggenheim. We enjoyed our stay at Hotel Miro. You can read more reviews on Tripadvisor here. 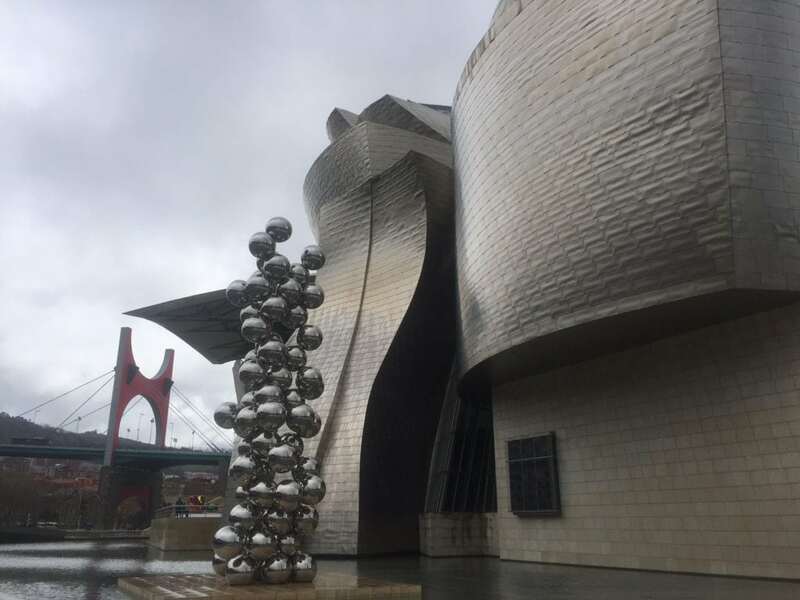 No financial compensation was received, but Hotel Miro Bilbao did offer a discount on our stay and complimentary tickets to the Guggenheim. As always, opinions are my own. This post also contains affiliate links. This means we will receive a small commission for some purchases made using links in our blog with no additional cost to you. Please be assured we would not promote any product unless we believe that our readers will also benefit. The commission does not influence the editorial content of this site. The tulips sculpture is amazing! Yes. There were so many great pieces at the Guggenheim, wish I could have taken pictures inside the museum. The Guggenheim is one of the places on my travel wish list – I love the architecture. I’m glad you enjoyed your visit, even if the weather was dreary! Susan – I hope you get to go there! The building itself is worth a visit. Gehry is my favorite architect right now. Love his buildings in NYC too. And inside the museum there is definitely some great art too! Very beautiful hotel! Love that you decided to spend some time in Bilbao. I like reading about the lesser known cities and destinations. Some of the lesser known towns we’ve visited (especially in Ireland) became our favorites. Yes, Hotel Miro was really a great find. I agree little towns can be so charming. Bilbao was much bigger than I expected though, and wish I would have had more time to spend there. Don’t feel bad, it pretty much rained the whole four days we visited the area as well! Loved Bilbao! I guess that is why it is so green! I wrote about Bilbao recently too (you can find my post here: http://tanamatales.com/bilbao-a-city-full-of-surprises/). Neither was the weather nice when we visited. However, we had the chance to walk around and I have to say I like the city a lot. And the food was to die for! Thanks Ruth. I will check it out. Forgot to say I used the Tulips photo too to promote my post. What a coincidence! I even got confused when I saw your thumbnail photo in the linky. Haha It’s a beautiful piece of art! Weather can be a pain on trips- looks beautiful photos though! The spa sounds lovely, a great way to end a trip! Thank you! For the most part we got lucky with the weather while we were in Spain but it can’t always be perfect. We just try to run with it as much as possible. And yes really enjoyed relaxing at the spa after a fun filled week. Thanks so much Danni. We tried to make the most of the bad weather.